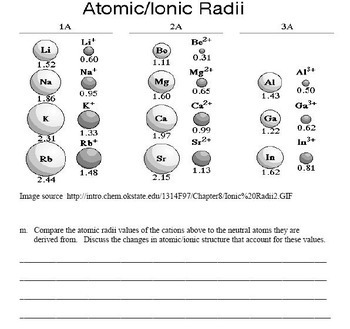 This 8 page activity allows students to use chemistry reference tables to examine properties of families and periods on the periodic table in reference to changes in atomic radii, electronegativity, and ionization energy. Students will be required to plot data involving these relationships. They will then be required to interpret and explain these relationships. 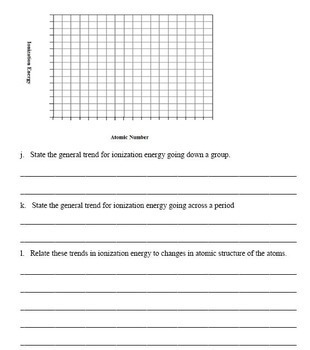 Students will also compare the sizes of ions to the atoms they are derived from and be asked to explain why these changes occur. 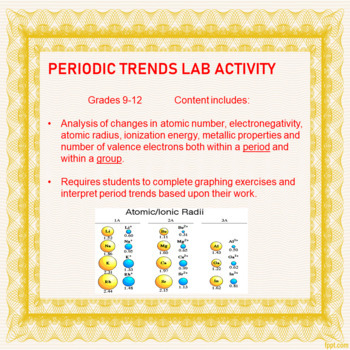 The learning goals addressed, NGSS standards and Common Core Reading/Writing and Mathematics Standards are listed on the first page of this activity. The zip file with this activity includes the student form of the activity in docx and pdf form, an answer key to the activity in pdf form and all required reference table resources in docx and pdf form.